James Mace has committed to Leamington for the 2018/19 campaign. 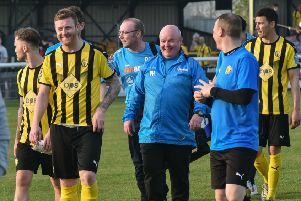 Leamington boss Paul Holleran freely admits getting the pre-season schedule right is a difficult balancing act but says it is not something that unduly troubles him. Brakes open their campaign with a visit to Racing Club Warwick on July 10 before hosting a family day on Saturday July 14 which will feature a clash with Derby County as the highlight. Two more Championship sides are pencilled in for home matches, along with a trip to Bedworth United on Tuesday July 17, before a final build-up game at home to Bromsgrove Sporting on July 28. However, with the benefit of experience, Holleran has learnt not to put too much store in what happens before the season kicks-off in earnest on August 4. “You’ve got to be careful. You don’t want it to be long and drawn out. “I’m mindful the players need time away to recover. “It doesn’t stop for me but, especially after the season we have just had, players need to get away from the environment. Connor Gudger and James Mace became the latest Brakes players to commit to the club for the 2018/19 campaign, joining Tony Breeden, Junior English and Supporters’ Player of the Year Jamie Hood in agreeing terms for the forthcoming season. Holleran admits he has hit a few dead ends in recent weeks but hopes to add to their ranks with a striker he describes as “the closest thing to Danny Newton I have seen”, while goalkeeper Brad Caswell has joined from Stafford Rangers and will work alongside Breeden. Caswell, a former Walsall Academy player, made several first-team appearances for Rangers in the Evo-Stik Northern Premier League before picking up a groin injury in March.